An e-commerce solution promises a safe online shopping experience through social recommendation. 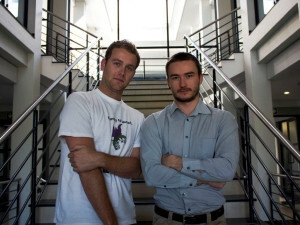 Cirqls founders Donovan Solms, CTO, and Mark Karimov, CEO. Recently, the story of a man who was scammed while trying to sell his motorbike online has been doing the rounds on social media. The buyer allegedly told him to hold his bag while he took the bike for a test ride, but never returned. As online shopping becomes more popular (about R1.5 billion was spent on online shopping in South Africa in 2012 alone), this kind of story is becoming increasingly common. This is why Mark Karimov and Donovan Solms developed Cirqls.com, an online marketplace that allows people to buy from other people they know, through people they trust. Cirqls.com gives you a personalised shopping experience online, says Karimov. Instead of risking being scammed by an unknown buyer or seller, users get to choose who they want to interact with based on the experience or recommendation of people they trust and know. Cirqls.com brings social experience to online marketing. It connects buyers and sellers through their social circles. By registering on the Web site using a Facebook account, a user will receive customised recommendations due to a "predictor" or "recommendation engine" that analyses their social feeds. Circles of trust around the user's social networks are then built to help them find products being sold by people they know very well, then by friends-of-friends. People, or stores, that friends had a good transaction with are shown and given priority. The site also brings the word-of-mouth concept online by utilising the user's social networks to track preferences and recommendations by contacts. Karimov and Solms both worked as mobile marketers prior to founding Cirqls. Karimov said selling his camera worth R10 000 online and on Facebook became a challenge when he realised he was not going to be able to see the people he would be selling to, nor be able to trust them. Hence the idea for this start-up emerged, and he would like to see it shaking up both the local and international marketplace scenes, he said. Cirqls.com has 34 registered shops at present, and has doubled its user-base within the week since launch. It also offers a classifieds section on its site that allows people to register for free and sell their second-hand goods.